Getting enough sleep? Sleep is the most underrated part of staying healthy, whether it's the holiday season or not. And let's settle this right now: Adults need seven to eight hours every night for optimal health. But what makes this wellness strategy so effective - and not just folksy health talk - is the deeper benefits that regular sleep provides to the body. It might just be the best healthy step you can take during the holidays. For example, studies show adults who regularly cheat themselves of sleep by two to three hours are much more likely to die of cardiovascular problems. In 2008, British researchers found that women who sleep less than the suggested eight hours per night are at higher risk for heart disease than a man not getting the full number of hours. The key factor was raised inflammatory markers in the women's blood. Would love to hear your thoughts. Thank you. Aptos sophomore Nikki Miyashita posted a 5-foot, 1-inch mark in the high jump at a qualifier at Los Gatos High to advance to the California Indoor Invitational on Feb. 6 at Fresno State University's Save-Mart Center. Articles I missed? Send them to albertjcaruana@gmail.com and I will add them to the list above. If you have 90 minutes available, here is an audio interview with former Aptos/Stanford runner Brett Gotcher along with his current coach, Greg MacMillan. This is the 3rd edition of Training Talk by the world famous running website. Listen up, joggers: No matter how hard you’ve been pushing yourself, you’re nowhere close to running at 40 mph - the fastest speed at which a body can biologically move, according to scientists. That’s the rate man’s muscle contraction speeds permit him to run, according to Wyoming University biomechanics expert Dr. Matthew Bundle, as reported in The Telegraph. At 40 mph, a runner would sprint across the finish line in a 100-meter race in 6.67 seconds – which is how long it took Olympic gold medalist Usain Bolt to reach the 60-meter mark, says The Telegraph. Bolt was clocked at nearly 28 mph in the 100-meter sprint, which sounds impressive until you consider that lions run at 50 mph when in pursuit of prey, and a cheetah’s speed approaches 70 mph. 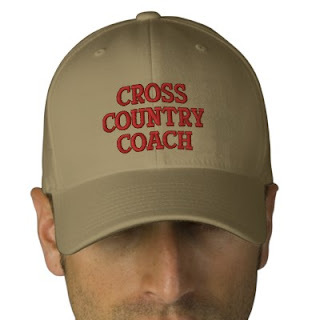 Results of the survey will be posted once there is enough data that a conclusion can be drawn as to what is the most challenging and least desirable aspects of coaching Cross Country and Track and Field. Thanks to Margaret Gallagher and Spencer Allen. Brett Gotcher has gone from regular fast guy with Olympic dreams and a part time job to regular fast guy who is spending his post-marathon recovery time answering more questions about his training (in one week) than he has had to his entire life - maybe. And all he did was run a marathon. Mind you it was the fourth fastest debut marathon in US history, 2:10:36. Not too shabby for a surfer-dude from Aptos California. Leading up to the Chevron Houston Marathon, Brett ran equally well when he won the National 20km Championships in September 2009 (58:57) and in the Aramco Houston Half Marathon (62:09) in January 2009. However, marathon running is risky business and getting everything to go just right on race day is a task requiring all the right moves, patience and a little good fortune – kind of like surfing – well maybe not exactly. Coach Greg McMillan is there to help guide the way, complimenting his blossoming talent and helping to foster Brett’s strong commitment to achieve more. Brett took the time to answer a few more questions, exhibiting that rare level of patience successful marathon runners possess. Here is our interview. Our exclusive interview with new 2:10 marathoner Brett Gotcher. Twenty-six-year-old Brett Gotcher knows what it means to run a breakthrough race. Last year, he upset a stacked field to win the U.S. 20K Championships. After a disappointing world half marathon showing in Birmingham, England last November, where he placed 64th, Gotcher resumed his streak of breakthrough races. Last weekend in Houston, Gotcher ran the fourth-fastest American debut marathon (2:10:35). Gotcher is coached by Greg McMillan. He lives and trains in Flagstaff, Arizona. Note also that Gilroy is currently in DI but will most likely drop to DII since they will probably have a greater than 15% change (this year they went from 2475 to 2059 with the opening of the new high school in Gilroy). “After a few days left alone, they put both groups of mice through a series of memory tests on a computer screen. It displayed two identical squares side by side, and if they nudged the one on the left with their nose they received a sugar pellet reward, while the one on the right yielded nothing,” the Daily Mail reported. Some great posts from Andy (picture by Margaret Gallagher) including a general overview of Shannon Rowbury's training. Brett, former Aptos and Stanford runner, just made his debut in the marathon running 2:10:36. Is the California State Cross Country meet fair competition? You can check out all the top returners for this coming Track and Field season in NCS thanks to Keith Conning and his blog THE CONNING TOWER. What is going to be the toughest event to qualify to the state meet this year for either the boys or girls? You are not on Twitter?? It's time you join NOW. You are really missing out on some great information out there. Join Twitter for free and start following people out there with similar interests. I will let you search for others. Lots of coaches and elite runners to find. Feel free to post runners and/or coaches you follow already that everybody should be following. Check out the following blog by former Maria Carrillo, current Sonoma Academy coach Danny Aldridge. 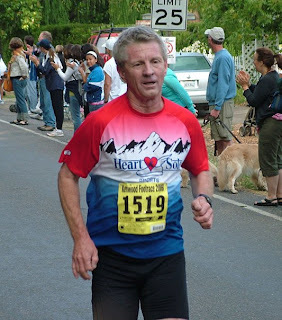 He is also a former elite runner who is back training to compete at the 50+ level. Some great insight into his training as well as some great stories from the past such as the Sebastian Coe story. Now that Track and Field is rapidly approaching, here is a picture from last season. 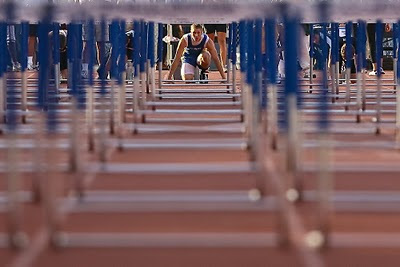 Gilroy HS Peter Guenther at the CCS Championship courtesy of the Gilroy Dispatch. This year's recipients are Taylor Lawson of St. Mary's Berkeley and Erik Olson of Novato. The Ohleyer Scholarship is a prestigious scholarship awarded by The Olympic Club Foundation. The recipient is a student whose athletic and academic interests are matched by personal qualities of leadership, involvement and community service. When an outstanding young Olympian lost his life in a traffic accident in 1996, the Olympic Club Foundation established a memorial award in his honor. The Brian Ohleyer Award was dedicated in 1997 to recognize bay area youngsters who demonstrate the ideals exemplified by Brian's life. A two-letter athlete at Redwood High School, Football Captain and recipient of all-league honors, Brian also maintained a 4.0 grade point average and was Valedictorian in 1987. He was the recipient of a National Football Hall of Fame Foundation Scholarship Grant and the Scholar Athlete Award for Marin County. Brian played Rugby all 4 years at Brown University and upon returning to San Francisco worked frequently as a Rugby official for local leagues. In selecting a recipient for the Ohleyer Award, The Olympic Club Foundation is looking for a young person who demonstrates outstanding leadership in academics, athletics and community service and whose accomplishments exemplify the highest ideals of sportsmanship, honor and caring. Past recipients of the Brian Ohleyer Award, include Jeffrey Deal, is a Galileo High School student, and a member of the Tenderloin Branch of the San Francisco Boys and Girls Club, Tony Dinh of Sacred Heart Cathedral Prep, Natalie Joffe of Marin Catholic High School and Sam Walsh of Serra High School. Each recipient will have his or her name engraved on the permanent trophy displayed in The Olympic Club's Trophy room. The Olympic Club Foundation will make a $1,000 contribution to the school or organization in their name and will provide $4,000 in scholarship funds when they graduate from High School and enroll in a 4-year college. Furthermore, the recipient will be invited to submit an application for membership to the Olympic Club, with initiation fees and dues waived until he or she reaches the age of 25. Marathoner Magdalena Lewy-Boulet, who competed for the United States in the 2008 Summer Olympics in Beijing, will present awards to members of the All-Sac-Joaquin Section boys and girls cross country teams at 7 p.m. Tuesday at Fleet Feet Sports, 2311 J St., in Sacramento. Among those to be honored is girls MVP Karlie Garcia, a freshman at Oakmont High School. Garcia won the section Division II championship and was fourth at the California Interscholastic Federation D-II state finals last fall. 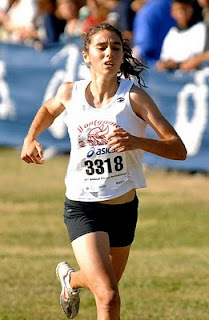 She also placed third at the Foot Locker West regional and 15th at Foot Locker's national finals. Garcia is the first girl from the section since Ponderosa's Jen Schindler in 1996 to be named a Foot Locker All-American. The award goes to the top 15 at nationals. Area girls voted to the first team are Vista del Lago's Madeleine Ankhelyi, Placer's Shannon Harcus, Del Oro's Emma Freeman, Oak Ridge's Hayley Scott, Sheldon's Breanna Lewis and Granite Bay's Brooke Holt. Area boys named first team are Davis' Corey Coates and Trevor Halsted, Del Campo's Josh Mercado, El Camino's Chris Kigar and Oak Ridge's Amjed Aboukhadijeh. Area athletes named to the boys second team are Adam Kelly-Strong, Jesuit; Grayson Hough, Davis; Steven White, Rocklin; and Nathan Williams, Oak Ridge. Area girls named to the second team are Oak Ridge's Samantha Ralstin, Davis' Christine Bowlus, Woodcreek's Courtney Crosta and Bear River's Breanne Mitchell. To get more conversation going on this blog, I added a message board to the front page. Check it out and let us know what is the toughest workout you have done in the past (cross country and/or track and field). If there are any errors please let us know. Hope everyone had a great time, and save the date for January 1st, 2011! Kurt Ruegg, Senior, Napa. Won Stanford D1 race. MEL League Champion. D1 Section Champion with the day’s fastest time – 15:40, 15th in the state in D1 with a time of 15:36 (3rd fastest SJS time), 10th at Foot Locker West and became only the second runner this decade from the SJS to qualify for Foot Locker Finals in San Diego where he was 32nd. Coach: Roger Ruegg. Jared Lester, Senior, Fairfield. D2 Section Runner-Up with a time of 16:18 (6th fastest SJS overall), 15:52 at the state meet (6th fastest SJS overall). Coach: Dave Monk. Josh Mercado, Senior, Del Campo. D2 Section Champion with a time of 16:16 (4th fastest overall), 15:56 at the state meet (9th fastest overall). Coach: Bill King. Corey Coates, Senior, Davis Sr. DVC League Champion. 3rd in D1 at section finals with a time of 16:16 (4th fastest overall), 15:55 at the state meet (8th fastest overall). Coach: Bill Gregg. Chris Kigar, Junior, El Camino. CAL League Champion. D3 Section Champion with a time of 16:00 (2nd fastest overall), 5th place at the state meet in D3 at 15:20 (fastest SJS time of the day). Coach: Tom Laythe. Trevor Halsted, Junior, Davis Sr. DVC League Runner-Up. D1 Section Runner-Up with at time of 16:05 (3rd fastest overall), 15:32 at the state meet (2nd fastest overall). Coach: Bill Gregg. Amjed Aboukhadijeh, Senior, Oak Ridge. SVC League Champion. 4th in D1 at section finals with a time of 16:23 (8th fastest overall), 15:53 at the state meet (7th fastest overall). Coach: Rob Fairley. Adam Kelly-Strong, Senior, Jesuit. DRL League Champion. 4th place in D2 at section finals (12th fastest SJS overall), 16:36 at state (10th fastest SJS overall). Coach: Walt Lange. Grayson Hough, Senior, Davis Sr. 5th in D1 at section finals with a time of 16:28 (9th fastest overall), 15:37 at the state meet (4th fastest overall), 19th in D1. Coach: Bill Gregg. Nathan Jackson, Junior, Big Valley Christian. Three-time D5 Section Champion. 16:59 this year at sections, 8th place at the state meet in D5 at 16:13, a 35-second PR. Coach: Steve Neubaum. Matt Airola, Senior, Bret Harte. MLL League Champion. D4 Section Champion with a time of 16:38, 9th place at the state meet in D4 at 16:02. Coach: Keith Maurer. Roberto Rosas, Senior, Grace Davis. MMC League Champion. 7th place in D1 at section finals with a time of 16:33 (11th fastest overall), Top 20 at state in D1 with a time of 15:39 (5th fastest overall). Coach: Richard Antal. Steven White, Senior, Rocklin. SFL League Runner-Up. 3rd place in D2 at section finals with a time of 16:19 (7th fastest overall), 16:08 at the state meet (17th fastest overall). Coach: Dan Pereira. Nathan Williams, Senior, Oak Ridge. SVC League Runner-Up. 6th in D1 at section finals with a time of 16:30 (10th fastest overall), 16:05 at the state meet (20th fastest overall). Coach: Rob Fairley. Karlie Garcia, Freshman, Oakmont. Won her varsity race at Mt SAC in a time of 18:07 – fastest time of all freshmen. SFL League Runner-Up to Brooke Holt. D2 Section Champion with the day’s fastest time (18:11), 4th in the state in D2 with a time of 17:52 (fastest overall SJS time), 3rd at Foot Locker West and qualified for Foot Locker Finals where she finished 15th and became the first girl from the Sac-Joaquin Section since Jen Schindler of Ponderosa (1996) - and only the third girl in SJS history - to be named a Foot Locker All-American (Top 15). Coach: Ryan Nugent. Madeleine Ankhelyi, Freshman, Vista Del Lago. Won Clovis D3 race, SVC League Runner-Up, 3rd in D3 at section finals with a time of 19:17 (7th fastest SJS overall), 10th at D3 State Meet with a time of 18:21 (2nd fastest SJS overall). Coach: Mike Livingston. Shannon Harcus, Senior, Placer. Won Nevada Union, PVL League Champion, D3 Section Runner-Up with a time of 19:14 (6th fastest overall), 12th at D3 State Meet with a time of 18:25 (4th fastest overall). Coach: Randall Fee. Emma Freeman, Junior, Del Oro. D3 Section Champion with a time of 19:13 (5th fastest overall), 18:40 at D3 State Meet (9th fastest overall), 9th place at National Junior Olympics. Coach: Kevin Ostenberg. Breanna Lewis, Senior, Sheldon. Won Frogtown Invite, 3rd-fastest SJS girl at Mt. SAC (18:26), DRL League Champion, D1 Section Runner-Up with a time of 19:03 (3rd fastest overall), 19:08 at the State Meet (16th fastest overall), 5th place at the National Junior Olympics. Coach: Glenn Rogers. Claire Miller, Freshman, Napa. MEL League Champion, 5th in D1 at Section Finals with a time of 19:34 (10th fastest overall), 18:49 at the state meet (11th fastest overall). Coach: Roger Ruegg. Christine Bowlus, Senior, Davis Sr. 2nd-fastest SJS girl at Mt. SAC (18:16), DVC League Champion, 4th in D1 at section finals with a time of 19:24 (8th fastest overall), 18:51 at the state meet (12th fastest overall). Coach: Bill Gregg. Maryssa McDuffy, Freshman, Grace Davis. MMC League Champion, 3rd in D1 at section finals with a time of 19:11 (4th fastest overall time), 19:06 at the state meet (15th overall fastest). Coach: Richard Antal. Courtney Crosta, Senior, Woodcreek. Won Trojan and Bronco Invitationals. 19:35 at section finals (11th fastest overall), Top 20 at state meet with a time of 18:25 (3rd fastest overall). Coach: Terri McKillop. Rebecca Hobby, Sophomore, Hughson. Won Bronco Invitational, TVL League Champion, D4 Section Runner-Up with a time of 20:06 (30th fastest overall), 4th place at D4 State Meet with a time of 18:25 (6th fastest overall), only sophomore on the All-Section team. Coach: Joel Bernard. Breanne Mitchell, Junior, Bear River. Won Wildfire and Mariner Invitationals. PVL League Runner-Up, D4 Section Champion with a time of 19:56 (22nd fastest overall), 10th place at D4 State Meet with a time of 18:35 (8th fastest overall). Coach: Chris Davis. 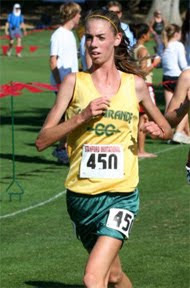 Today we chat with current Santa Clara University and former Archbishop Mitty HS runner, Stephanie Wilson. She is coming off a historic cross country season for Santa Clara as she became the school's first ever runner to compete in the NCAA championship race. Wilson took advantage of her one opportunity to run in the national meet by finishing in 28th place which gave her All American status. Considering her competitive but not spectacular high school cross country and track and field times, it's been quite an ascent for her to reach that level. Without further adieu, here is my interview with Stephanie Wilson. 1) When and how did you start your involvement with the sports of cross country and track and field? The summer before my sophomore year, a middle school friend invited me to her high school’s Cross-Country practice. I already liked running and hiking, and after running with that team I decided to try out for my own high school’s team. My first year I wasn’t very serious though; I mostly did it to get in shape for soccer. I continued with Cross-Country the next three years, but I only ran Track my senior year of high school. 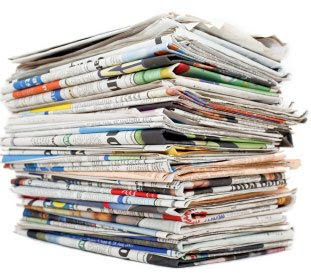 2) What were some of your personal records in high school for cross country and track and field? I ran 19:26 at Crystal Springs my senior year, and I ran a 5:34 mile in Track. 3) What was your first college experience at UC Davis? I was really committed to soccer when I was in high school, and I wanted to play soccer for a D1 program. I tried out for the soccer team at Davis the summer before I started, and I was cut in the second session. Then I tried Crew for a little while, but I didn’t like the training very much. I started running while I was still practicing with the Crew team, and I entered the Davis Turkey Trot—a 10K. I remember running really hard and struggling to stay faster than my goal pace, and then kicking it in through the last stretch. I had forgotten how intense and rewarding running and racing could be, and at that moment I knew that I wanted to run again. 4) Why and how did you decide to transfer to Santa Clara University? During the end of Fall quarter, I started to get really homesick. I’ve lived in the same house in San Jose my whole life, and even though Davis isn’t that far from the Bay, I really missed my family and my home. During Winter quarter I just got more and more homesick, and sometime then I decided that I wanted to move back home. My parents told me to think about Santa Clara. 5) What was the first success that you experienced at Santa Clara? I guess my first real racing success was the 3K at Pepperdine my sophomore year. I broke the Santa Clara record and ran a lot faster than I thought would. But I think even more important than that was the time trial we did before that at the end of Cross. That was the first time I really applied the right racing mentality. I didn’t think about the end of the race; I just tried to stay in the moment and keep up with my teammate. I got a PR that day and for the first time that season I felt like I was racing. 6) What do you feel like you have done differently (training wise) at Santa Clara that has been responsible for your improvement? Lots of tempos and lots of mileage. I’m running faster and longer than I ever did in high school, and I’ve been lucky so far and haven’t gotten injured. I’m also focusing solely on running now; soccer used to be my sport and running was sort of something I enjoyed on the side. I really believe in Tom and Felipe’s training (our coaches at Santa Clara)! I also know how to race now—I go into every race with the mentality that I will never give up at any point during the race and I will take the race one step at a time, focusing on the mile or K that I’m running right then. I’ve also learned a lot about the running lifestyle from my teammates. 7) Going into this season, what were some of your goals? Tom told me at the beginning of pre-season that I had a chance of winning WCCs. From that point on, I took the season one race at a time. When Sac State came around, I told myself that if I was legitimately going to try to win WCCs, then I had to win Sac State. I didn’t think I would make it to Nationals though. I always knew that there was a chance, but it wasn’t until after Conference that I really thought I could go. 8) How did your past season progress going into the WCC race? It went about as perfect as a season can go. I won Sac State and then I placed 10th at Stanford, and I got 2nd at our home invitational—the Bronco Invite. All my workouts went really well too, and I stayed really healthy during the whole season. Tom and Felipe planned out the workouts and my racing schedule so that I would be in top form during the end of the season, and it all worked out. 9) What was your plan going into the NCAA race? I wanted to be in the top 40, which would mean I was All-American. Tom’s son JT Service, who ran at Nationals for UCSB, had warned me that the race would go out really fast. So my plan was to not get too phased by the start and to be around the top 60 or so going into the first mile. I wanted to stay relaxed in the beginning of the race and keep confident that the other runners would not be able to hold the pace, and then move up into position. 10) How did you first find out that you were an All-American and what was your reaction? I had three teammates and a teammate’s sibling cheering for me during the race, and they would yell out what place I was in while I was running. Going into the final stretch I knew I was somewhere in the high 20s or low 30s. When I found out my actual place I was excited, but mostly just surprised at the whole thing. I never thought I would get that far, and I’m still sort of shocked when I think about it. 11) As you approach the end of your collegiate career, any thoughts of post collegiate running? I would love to run post-collegiate, and I want to have a solid track season and then assess where I’m at. I really love the running lifestyle and as long as I’m healthy I want to see how far I can go. I’m going to run my first 10K on the track this season, and I think that will give me a taste of the longer distances. I’ll probably train for the marathon. 12) What would be your advice for current high school runners that have the ambition to run in college but might not have the times that would interest college coaches? If you love it, then just do it. Don’t worry about standards or expectations. Running in college requires a lot of discipline and hard work, but it can be one of the most rewarding experiences of your life. Speed is an important variable in many sports, but in our sport, speed is one of the most important. For as long as people have run, they have tried to figure out how to run faster. A simplistic approach says to improve speed you need to increase stride length and/or stride frequency. Many athletes and coaches have concentrated on improving stride length and have found both stride frequency and overall speed decrease. 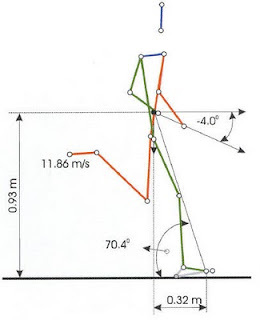 It is usually more effective to work on stride frequency because this increases the power in the leg muscles that naturally increase an athlete’s stride length. The easiest way to determine your stride frequency is to count the number of times your right foot lands during one minute of running. Each time your right foot lands is a cycle. Repeat the one-minute runs at different speeds from an easy jog to 1600m pace. If you find that your stride frequency is 90 cycles or more per minute (180 steps) and is similar for various speeds then you are in the range most elite athletes are. If your stride frequency is less than 90 cycles per minute then make a conscious effort to increase your stride frequency. To do this, concentrate on quicker, lighter, relaxed steps, with your feet landing under your center of gravity. Cross country runners need to maintain stride frequency when running up hill by adjusting the stride length. If you let stride frequency slow down you will find that fatigue sets in and it is harder to get back to the desired stride frequency once you are over the crest of the hill. Remember, stride frequency is neuromuscular, so the more you practice this the less you’ll have to think about it. Next time you are feeling tired and want to increase your pace, try concentrating on increasing your frequency; you may be surprised how easily you can speed up without increasing perceived effort too much. The original Farm Team Coach, Jeff Johnson, had his athletes do stride frequency tests on occasion. While running relaxed at 1600m pace for 60 seconds athletes would count their cycles. Less than 90 (180 steps) suggested the need to work on increasing frequency. Jack Daniels book Daniel’s Running Formula also suggests using the 90 cycles (or 180 steps) number when gauging stride frequency. While Jeff Johnson of the Farm Team did 1-minute reps many coaches use shorter durations to work on stride frequency. Another popular drill is to run 3 or 4 “20-second counts” during an easy warm-up run. You can count right foot touchdown, so the 90 cycles figure was equivalent to a count of 30 for this drill. If you want to do ten seconds, you would want 15 cycles to equal 90 cycles per minute. A good time to do this is while doing strides before a workout. One benefit of this drill that I did not anticipate came in racing. Some runners have told me that when they got to a tough part of their race where they had trouble keeping their rhythm, they would count off 15 or 30 quick strides like they’d done in this drill. Others said they felt it helped to think about turning over when trying to close the gap on a competitor. So this simple drill that adds zero extra time to a normal workout or run resulted in another way to get through the tough part of the race for many. Stride frequency is often overlooked in our never-ending desire to take our fitness to higher levels. I have seen these drills make a remarkable difference for high schools kids at summer running camps for years. It’s amazing the progress they make in a week when they warm up twice every day with stride frequency drills. It’s not as glamorous as a 400s on the track or mile reps on the cross country course, but this is something that can help you race faster. Remember, a workout doesn’t have to have you wasted from fatigue to help you get faster. Give it a try next time you’re warming up or doing strides. Tony Kauke has coached at Piedmont High School, City College of San Francisco, and the Impala Racing Team—a post-collegiate women's training group based in San Francisco. He's also a co-founder of the newly formed Bay Area Track Club (http://www.bayareatrackclub.com/). He ran for Alhambra High School in Martinez and The College of Wooster in Ohio. Check out Jay Johnson's post on his blog about peaking. Good read. 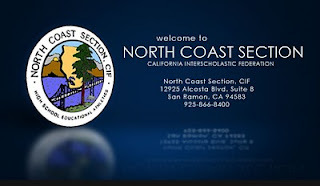 Top Northern California returners in every Track and Field event posted.